The Board may discharge a person from imprisonment (411) or parole supervision (414) prior to the sentence expiration date or prior to the expiration of parole. Community Corrections, a Division of the Department of Corrections, may recommend a 414 to the Board because of exceptional performance while under supervision. A commutation of sentence is a change or modification of a sentence imposed by the court. The Governor may only grant a commutation of sentence upon recommendation of the Board (A.R.S. §31-402). Applications for a Commutation are available on this website in the "Forms" section. 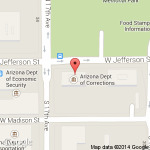 Completed applications should be sent to the Department of Corrections, Time Comp Division, 1601 West Jefferson Street, Phoenix, Arizona 85007. Applications sent directly to the Board of Executive Clemency will be returned to the originator. Only those applications certified as eligible by DOC will be forwarded to the Board for consideration and scheduling. The Phase I Hearing is an in-absentia hearing at the Board office. The Board will vote to either move the matter forward to a Phase II hearing or deny any further action. Members of the public, victims, inmate's family and supporters, etc. are permitted to attend the Phase I hearing but there is no “call to the public” for testimony to the Board. The order of hearings is set by the panel chairperson on the day of the hearing. Members of the public, including attorneys, may attend and observe a Phase I hearing but will not be permitted to speak. Only the board members will discuss the application and make a determination of action by vote. During the Phase I hearing, members discuss the inmate’s information provided in the application itself, sentencing documentation, Presentence Investigation Report, past criminal history, facts of the offense(s) presented to the court, plea agreement if applicable, institutional behavior record, and any other documents provided by officials and/or interested parties. It is the responsibility of the applicant to submit any and all programming, educational or other treatment documentation that he/she wishes to have considered by the Board. After carefully discussing the matter, the members will vote to determine if the application should be elevated to a Phase II hearing. A Phase II Commutation Hearing is a hearing normally conducted with the inmate present via telephone or video conferencing. In some cases a Phase II Hearing may be conducted at a state institution with the inmate in attendance. The Board will vote to either deny further action on the Commutation Request or will recommend a reduction of sentence to the Governor. The Governor cannot consider a Commutation of Sentence without a recommendation from the Board. If the Board does recommend a reduction in sentence and the vote of the Board is unanimous the Governor must make a determination on the Board's recommendation within 90 days. If the Board recommends a reduction in sentence but the vote of the Board is not unanimous then the Governor will make the final decision on the Commutation Request at their convenience. The time of a scheduled hearing, on the scheduled hearing day, is determined in cooperation with the Department of Corrections and is based on their security concerns. A conditional release from incarceration which entitles the parolee to serve the remainder of the parolee's term outside the confines of a penal institution so long as the parolee satisfactorily complies with all the terms and conditions of their release and supervision requirements. A program for those inmates who are eligible to complete their prison sentence in the community. The Home Arrest program is a restrictive program using active electronic monitoring surveillance and the supervision of a Home Arrest officer. A person in the Home Arrest program is under inmate status and subject to all of the rules and regulations of the Department of Corrections. Except for authorized movements out of the residence, such as employment or mandated treatment programming, the inmate is confined to his residence. An act of grace, which absolves the convicted felon of the legal consequences of their crime and conviction. The Governor cannot grant a pardon unless the Board (A.R.S §31-402) has first recommended it. The Pardon application packet is not available through this website. You must request this packet from the Board office. A mechanism to parole an inmate to a consecutive sentence to be served at an institution in this state or in another jurisdiction. A delay or temporary suspension of the carrying out of punishment. The Governor may only grant a reprieve upon recommendation of the Board (A.R.S. §31-402). A release from prison, which allows the inmate to maintain gainful employment and pay restitution to the victim of the inmate's offense.